Summary and Definition: The Shawnee tribe were a nomadic tribe of hunters and farmers who migrated across many areas in the Northeast and Southeast. 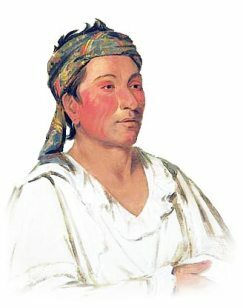 Many of the Shawnee adopted European style clothes and favored cloth turbans or bandana style head wear. The names of the most famous chiefs of the Shawnee tribe included Chief Cornstalk, Tecumseh (1768 – 1813) and Chief Blue Jacket (c1743 - c1810). Where did the Shawnee tribe live? The Shawnee tribe originated in the Tennessee region around the Cumberland River but they migrated to many other parts of America. 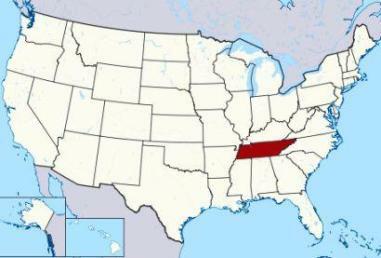 The Shawnee Home Tribal Territories were Tennessee, South Carolina, Ohio, Pennsylvania, Kansas, Oklahoma and Texas. The Shawnee tribe adopted the lifestyles that were best suited to the climate, geography and natural resources of the different regions that they lived in. Due to the semi-nomadic life of the Shawnee they came into contact with the tribes of various Native Indian cultures. The Shawnee tribal groups included the Northeast and Southeast Native Indian and even the Plains cultures. Following the American Civil War, many Shawnee in Kansas were blended into the Cherokee Nation and were known as Cherokee Shawnee. What did the Shawnee tribe live in? 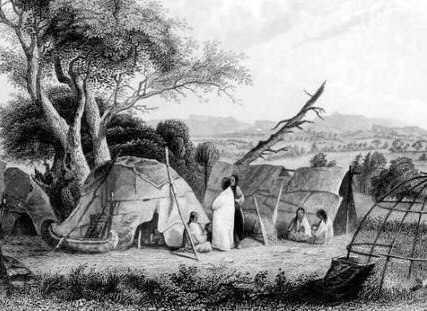 Many of the nomadic Shawnee tribe lived in Wigwams, aka wetus or wikkums, which are also known as birchbark houses. This type of temporary shelter was used by Algonquian speaking Native Indian tribes who lived in the woodland regions. Wigwams, or wetus, are small cone-shaped houses with an arched roof made of wooden frames that are covered with woven mats and sheets of birchbark which are held in place by ropes or strips of wood. Some Shawnee wigwams were covered with buffalo hides if this was a major resource in the area Wigwams were usually about 8-10 feet tall and 10 - 15 feet wide at the base. What language did the Shawnee tribe speak? The Shawnee tribe spoke in the Algonquian language. What did the Shawnee tribe eat? What weapons did the Shawnee use? The weapons used by the Shawnee tribe included bows and arrows, a variety of different clubs, hatchet axes, spears, lances and knives. The rifle was added to their weapons with the advent of the white settlers. What clothes did the Shawnee tribe wear? The clothes worn by the Shawnee tribe were dictated by the climate. In warm climates they wore breechcloths in the summer and in cold climates they wore fringed tunics or shirts and leggings. Warm robes or cloaks were also worn to protect against the cold and the rain. The Shawnee tribe also adopted the types of clothes worn by the white settlers and that were available through trade. Shawnee men wore cloth shirts made of cotton or calico, and European style trousers or pants. Their jackets were often in the style of frock coats. Cloth turbans or a type of bandana were a popular form of headwear. Their turbans were made of a woolen shawl, sometimes covered with a piece of calico or even silk. The turbans were occasionally encircled by a band of metal (tin or siver) and adorned by feathers. Who were the most famous leaders and chiefs of the Shawnee tribe? The most famous leaders and chiefs of the Shawnee tribe included Chief Cornstalk, Tecumseh (1768 – 1813) and Chief Chief Blue Jacket (c1743 - c1810). Shawnee History Timeline: What happened to the Shawnee tribe? The history of the Shawnee people dates back to the ancient Adena culture. The following history timeline details facts, dates and famous landmarks and battles fought by the Nation. The Shawnee timeline explains what happened to the people of their tribe. 1791: Battle of the Wabash on November 4, 1791. American Indians were led by Little Turtle and Blue Jacket won a major Native Indian victory against Americans led by General Arthur St. Clair. 1810: The Death of Blue Jacket. Chief Tecumseh continued the Shawnee fight during Tecumseh's War in a final attempt to reclaim Shawnee lands in the Ohio Country. 1830: The Indian Removal Act was passed calling for the relocation of all tribes to “Indian Territory” west of the Mississippi River. For additional facts and information refer to the legend and the Story of Tecumseh and the Wars with the Western Indians.